As we discussed some months ago, there are intriguing links between the failure of the plan to replace housing at the old Y site and the current proposals to have a conference center across the street at the Library Lot. Our earlier article recounted some of the history of William Street Station, the development proposed by HDC Construction Company in response to the City’s RFP to replace the supportive housing lost when the old Y was closed. The project was voted down by council on November 5, 2007, in an action that a contemporary account said left the developer “stunned”. Now HDC is suing the city. The lawsuit reminds us that the developer had by then obtained $18.5 million in low-income housing tax credits from MSHDA (the state housing authority) and a $7.5 million MEGA (Brownfield) grant. Those were both lost with the cancellation of the project. Could it be that what killed the project was its last iteration, in which HDC proposed to build a hotel and conference center as the money-making part of the project? One problem that the developers faced was that the main source of subsidy for the affordable housing, the low-income tax credits, are only effective for 15 years. But the council wanted the supportive housing in perpetuity. Another problem was that through 2007, the leading edge of the Michigan recession and general decline in housing demand made the original plan’s viability questionable. (It would have combined market-rate housing with the supportive housing tower.) So HDC came up with a revised plan that would have combined a hotel-conference center, the housing, and the bus terminal (don’t forget that this was also a joint project with AATA). Only weeks before its death, a revised site plan for the project was approved by the Planning Commission. Could it be that several people on the inside track began to look at this concept and conclude that it might be better without the distressed population of the supportive housing tower and the bus station? After all, a “world-class” facility is…classy. We don’t have a record of the conversations going on behind closed doors in late October 2007, but they can be imagined. Even then there were occasional news stories about efforts to find other locations for the housing. One email conversation between CM Leigh Greden and CM Margie Teall is available by virtue of the citizen FOIA project. The exchange took place on November 5, 2007. (Teall and Greden apparently voted to extend HDC’s option, though mayor John Hieftje voted against it.) One interesting statement is, “John H wants the units outside downtown, scattered. If HHSAB comes up with a statement that the units don’t need to be downtown, it frees up strings on the Y site.” The significant thing about this observation is that it was made on the same night that the William Street Station project was killed. 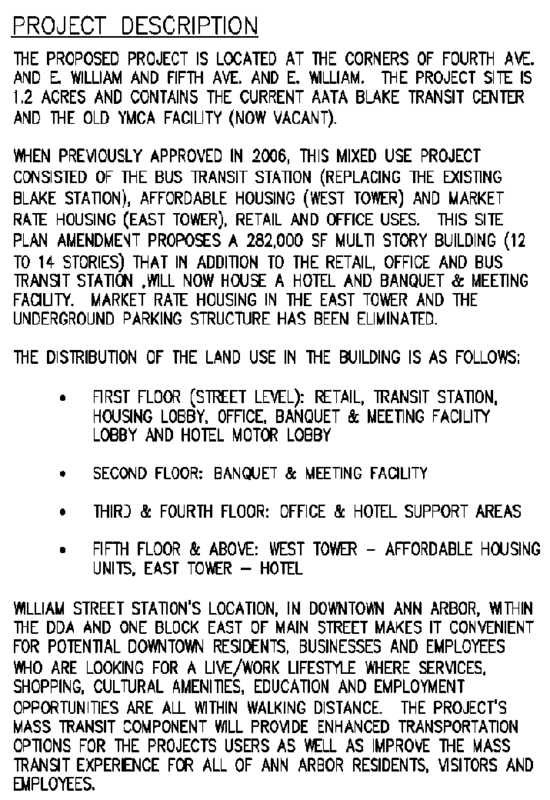 October 2007: The site plan for the William Street Station hotel and conference center is approved at Planning Commission. November 2007: The project is killed. December 2007: Bernstein and Guenzel have coffee at the Cafe Verde and decide a conference center is a great idea (as reported in the Ann Arbor News some months later). April 2008: Bernstein organizes a forum to discuss a conference center and Roger Fraser is quoted as saying he wouldn’t mind seeing a conference center over the Library Lot. But even as the first discussions are breaking in the News, an email discussion with DDA director Susan Pollay links Bernstein with two later members of the Valiant partnership (they of the Secret Plan). Fritz Seyferth and Bruce Zenkel have already, as of April 9, 2008, had one group of prospective investors tour Ann Arbor and are now working with a second. By December 2008, as reported by the Ann Arbor Chronicle, the council is hearing about other possible sites to locate the 100 units of supportive housing. Two of them belong to Washtenaw County. At this time, I heard anecdotal accounts that Guenzel was meeting with commissioners to win acceptance for the county making one of them available (it never came to pass). Thanks to another story (January 18, 2010) in the Chronicle, we now learn that Fraser had an early version of the Secret Plan at a council Budget and Labor Committee meeting and was told by the councilmembers there to “put it on the shelf”. But instead, he presented it at the January 2009 council retreat. All this makes it clear that there was an inside track and that the participants had hoped that the Valiant proposal would be accepted without too much fuss. Since last summer, the process has instead been becoming more and more open to discussion. It is a test now of the current council (many of whom were not involved with the inside story) as to whether the Valiant proposal will in fact be accepted despite the considerable risk it would involve to the city. (Even the Secret Plan says that most conference centers have to be subsidized.) It will probably always be a mystery how much this concept had to do with the failure of the William Street Station project. But maybe we’ll now be running on a fully public and accountable track. Putting everything about the RFP on the city website is a great start, and the RFP Advisory Committee has made meetings open to the public and even a chance for public questions at the interviews. What a nice thought for a new year. UPDATE: AnnArbor.com reports that HDC’s lawsuit was denied in Federal Court. SECOND UPDATE: Today (March 30, 2012) AnnArbor.com reports that HDC’s appeal also failed and the City of Ann Arbor declares a final victory. This entry was posted on January 19, 2010 at 11:31 pm and is filed under Business, civic finance. You can subscribe via RSS 2.0 feed to this post's comments. You can comment below, or link to this permanent URL from your own site. I find it somewhat coincidental how much of this is smoking gun is becoming known around the time of Jayne Miller’s departure (of the FOIA clearance team in city hall)… Then again, I have a bootleg of the Zapruder film. I can positively state that Jayne Miller is not one of my sources. Last night at council, Fraser reported that one of the library lot developers had already pulled out. I believe it is the senior housing project. I doubt that Miller has the final say on sensitive FOIA requests. Those go to the city attorney’s office. As a planner, The first HDC plan looked pretty good to me. It included transit and other public services on a convenient site. plus a suply of affordable housing, which are in short supply in AA. And MSHAA and Brownfields funding. If it had been reduced in height to eight and nine stories it would have fit into the area better that 12 and 14 stories,but HDC may have need revenues from that many residential units–plus the commercial units on the ground floor–to pay for it. of the city for many years. Apparently, it will also cost us critical public services such as fire and police protection, a senior citizens center and swimming pool–not in the DDA area. Without offering any opinion on the viability of the HDC litigation, I think that suit could have some interesting repercussions. Let’s suppose that the litigation survives long enough for the Plaintiffs to conclude the discovery process. What if that discovery process includes depositions of current and former council members and city administrators? What if the deposition testimony reveals that officers or agents of the City made “representations” (see appendix A of the Library Lot RFP) to another developer that made the HDC Y-site proposal less attractive and led to the cancellation of that project? After the City Council makes a decision on the Library Lot RFP, will it be sued again? For example, if Valiant is selected, would other developers sue the City claiming that Valiant violated the requirement that it have no prior commitment from the City regarding the project? (again, this refers to Appendix A of the RFP) If Valiant is not selected, would it sue the City claiming that agents of the City had made commitments to Valiant to build its conference center? I don’t believe it is far-fetched to anticipate that an unhappy developer will sue the City after a Library Lot decision is made (even if that decision is to do nothing at all). That vulnerability can be traced back to the City’s rush to do something on that property before seeking public input. Unfortunately, it will be the tax payers who foot the bill. Perhaps this administration should rename its RFP (request for proposals) process to something like RFL (request for litigation). This is the part that really gets me. He felt betrayed???? Well, enjoy it Mr Bernstein. It’s how those of us paying attention to these shenanigans feel ALL the time. Not so cozy over here, is it?